NEW YORK, N.Y.- June 12, 2018 —Get ready for a brand new season of comfy pants and floor snacks! Creator Natasha Allegri, Frederator Studios (a WOW! Unlimited Media company), and VRV, a fan-focused aggregation platform from Ellation featuring premium SVOD channels, announced today that a new “Bee and PuppyCat” story, “Bee and PuppyCat: Lazy in Space,” is in production and set to launch in 2019. The series will live exclusively on VRV within the Cartoon Hangover Select channel. Tokyo-based OLM, Inc., known for such big hits as the “Pokémon” animated franchise, with support from its subsidiary in L.A. Sprite Animation, will be co-producing with Frederator Studios (“Castlevania,” “Adventure Time,” “The Fairly OddParents”). “Bee and PuppyCat” creator, Natasha Allegri, will serve as showrunner. 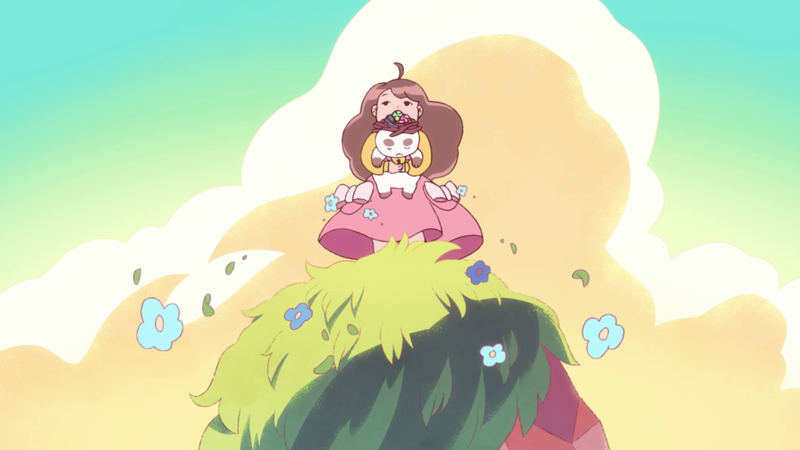 In the new series, “Bee and PuppyCat: Lazy in Space,” the beloved lead characters’ world is even more expansive (and possibly in danger) as the pair combat problems big, small, and totally weird, all while trying to make rent in time. In addition to a new storyline, “Bee and PuppyCat: Lazy in Space” will feature longer, half hour episodes, along with an extended season. Allegri has relocated to Japan specifically to oversee the show’s creative at Tokyo’s OLM to ensure the new series comes to life with a look and feel that rings true to the original production. The “Bee and PuppyCat” franchise has resonated with fans from the beginning. More than 40 million minutes of the original “Bee and PuppyCat” two-part pilot have been watched on YouTube, and over 18,000 fans contributed to a Kickstarter for the series in 2014, making it the most-backed animation project in Kickstarter history. Over the years “Bee and PuppyCat” has continued to grow into a pop culture phenomenon, spurring a line of cookbooks, plush toys, and more inspired by the characters. In addition to “Bee and PuppyCat,” Frederator Studios is also behind several hit series of the past decade for TV, SVOD, and internet including Butch Hartman’s “The Fairly OddParents” on Nickelodeon, Pendleton Ward’s “Adventure Time” on Cartoon Network, and more recently “Castlevania” for Netflix. OddParents on Nickelodeon, Pendleton Ward’s Adventure Time on Cartoon Network, and Castlevania, based on the Konami video game, for Netflix. VRV is a leading audience-focused aggregation platform featuring premium SVOD channels including Crunchyroll, Funimation, DramaFever, Rooster Teeth, and Shudder, alongside a curated house channel, VRV Select. Created to provide fans with a next-gen entertainment experience, VRV offers immersive content experiences in a digitally-driven environment via bundled subscription, a la carte subscription, or ad-supported options. As a platform, VRV helps partners extend their reach and distribute their premium content through a high-quality, branded experience on mobile, web, and popular living room devices. OLM, Inc., one of Imagica Robot Holdings Group’s companies, is a Tokyo-based production company with renowned animation, live-action, and visual effects divisions. Best known for their work on the Pokémon films and television series, OLM’s credits include a variety of projects for the global market, ranging from traditional 2D anime, to video games, to live-action and CG-hybrid feature films. Los Angeles-based Sprite Entertainment, Inc., a subsidiary of the OLM Group, is a boutique CGI animation house specializing in the production of high-quality animated content, as well as providing anime localization and 2D animation production support services for their parent company. Creatively helmed by Moto Sakakibara, Sprite has produced numerous television projects for top-tier networks such as Disney and Netflix. Their first feature-length CG film, Rudolf the Black Cat, opened to critical and commercial success in 2016.